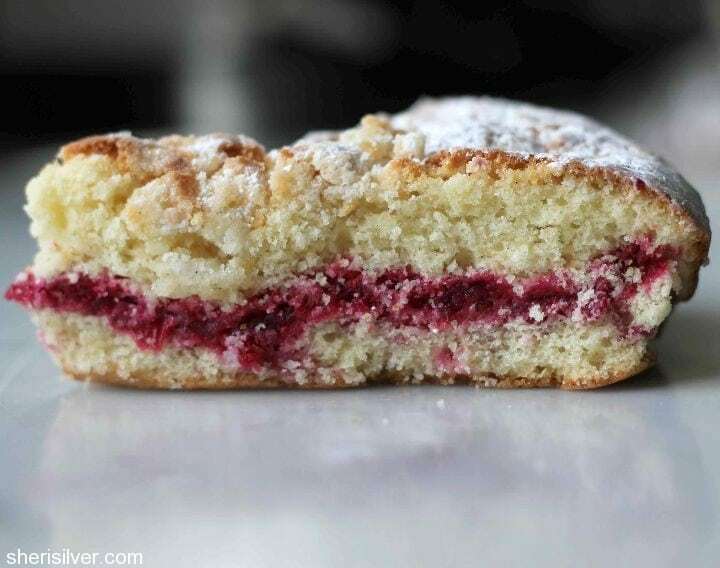 national coffee cake day – really. Wow, people – busy, busy weekend! Passover started last night (for desserts read here, here and here). Easter is tomorrow. Aaaand, did you know that today is National Coffee Cake Day? I really should have known this, having just barely missed National Blueberry Popover Day last month. I even shared with you the link that lists every single American food holiday to prove that this day was for real. You should take a look at this site; it’s most amusing. There’s a “day” for Kahlua (February 27), Lobster Newburg (March 25) and even Toasted Marshmallows (August 30; note: there is no “Marshmallow” day – it’s toasted only – whatever). This is one of my favorite coffee cakes (and coffee cakes are one of my favorite things). 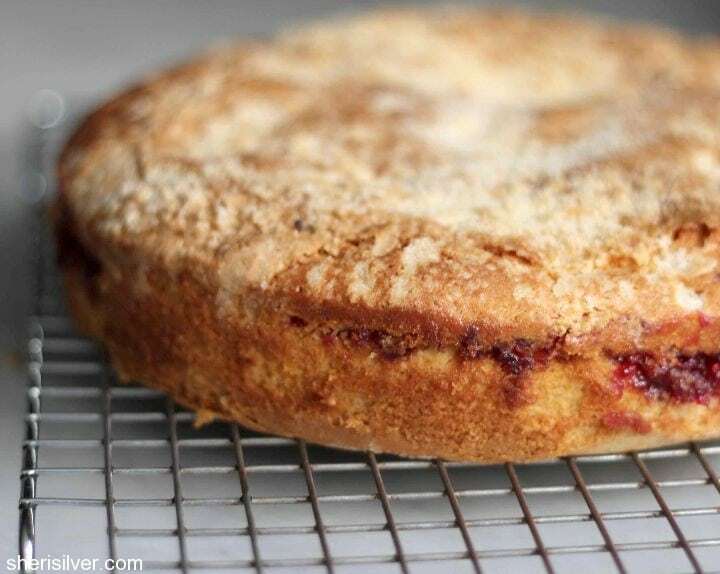 Nice and moist, with a pretty, jewel-toned cranberry ribbon running through the middle, perfectly tempering the sweetness of the cake. The crumb topping, which looks like it will be barely perceptible, lends a really nice crunch too. So get cracking! Sadly, I will not be partaking this year as the holiday falls during Passover, when I cannot bake with or eat anything containing flour. But you can be sure that I’m on it for Taffy Day (May 23). Preheat oven to 375. Line the bottom of a 9 x 2 round cake pan with parchment paper; grease and flour the pan. Scrape seeds from vanilla bean into a food processor with tip of a paring knife (what to do with the pod? Make vanilla sugar). Add sugar and pulse to combine. Transfer to a bowl. Return 1/2 c. (100 g.) of the vanilla sugar to the processor and add the cranberries. Pulse the mixture until finely chopped, being careful not to purée. In a medium bowl, whisk together 2 c. flour, baking powder and salt. Using your mixer, beat 1 stick butter and 1 c. (200 g.) of the vanilla sugar at medium-high speed until pale and fluffy. Add eggs 1 at a time, beating well after each addition. Scrape down the bowl. Add the flour mixture in batches, alternating with the milk and beginning and ending with flour. Mix on low speed until just combined. Spread half of the batter in the pan. 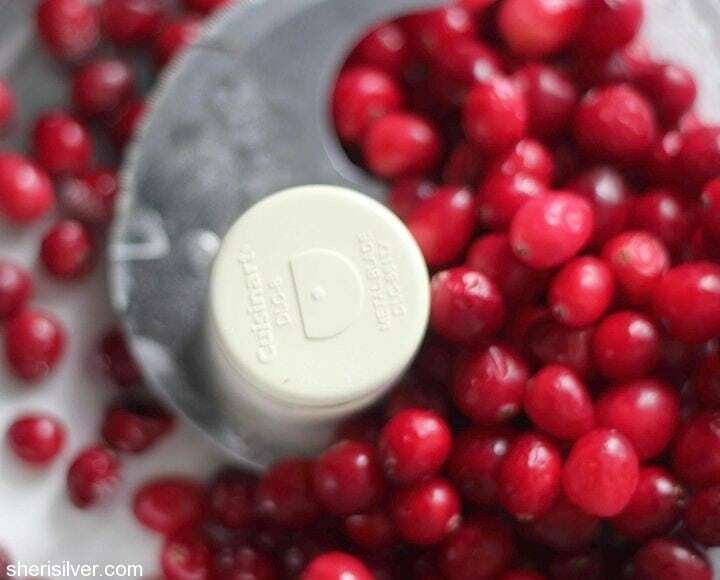 Spoon cranberries over the surface, leaving a 1/2″ border around the edge. Spoon small dollops of the remaining batter over the top of the cranberries and using a small angled spatula, spread evenly. Using your fingers or a pastry blender, work the remaining 1/4 c. (50 g.) of vanilla sugar in with the remaining tablespoon each of butter and flour. Sprinkle over the top of the cake. 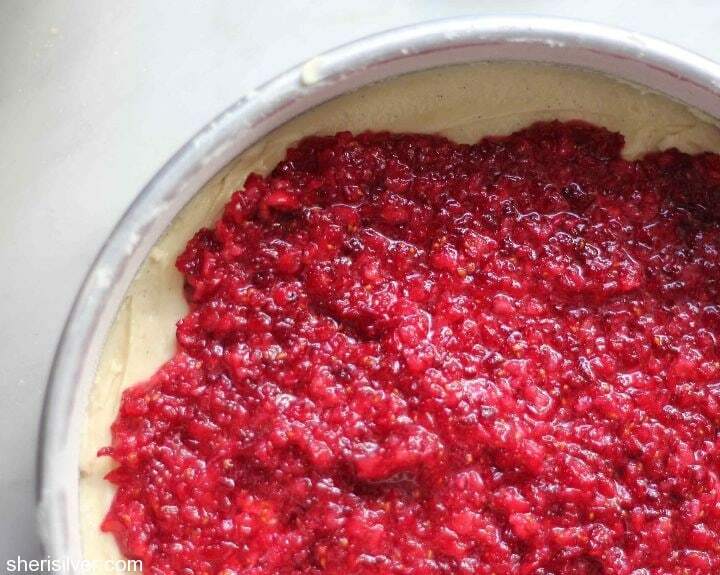 Bake until a wooden pick inserted into the cake (not into cranberry filling) comes out clean and the sides begin to pull away from pan, 45 to 50 minutes. Cool in pan 30 minutes, then remove from pan and cool completely, crumb side up. This this looks fabulous! I love coffee cake. Adding this to my must make list. 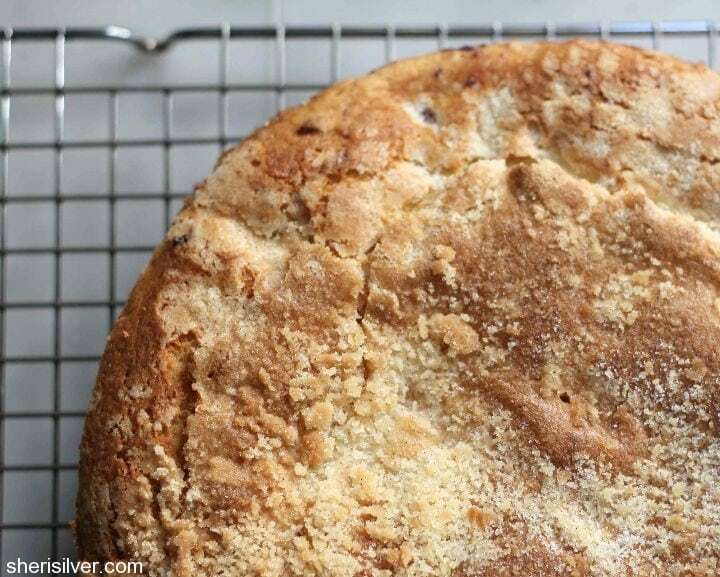 This coffee cake recipe is one that I will try. I love your recipes and do make many of them. However, I have a “complaint.” Not a serious one, but I would love this site to have a “button” to push where I can just print out the recipe. I wind up copying the recipe (pasting it into a word document) and deleting the beautiful photos and making the recipe fit on one page. We just got back from gorgeous Sicily and southern Italy. Food yummy and vistas beautiful.